To those who lack vision, people who have lofty ambitions and high expectations are often considered crazy. These people see the world through a prism with limited color possibility – to them, everything has a natural ceiling where just standing upright will result in you bumping your head. In fact, most people are like that. You hear people talk about crabs in a bucket – when one crab tries to climb out of the bucket, the others will attack it and pull the potential escapee back down. That metaphor leads nicely towards one particular crab that doesn’t just want to escape the bucket, he wants to send a bunch of crabs to Mars and let them live there while the rest of us drive electric cars powered by energy created from our solar panel roof. Yes, I’m talking about Elon Musk. Musk is the ultimate ambitious dreamer with lofty goals. Putting aside his ambitions to create affordable, self-driving electric cars, re-engineer the roof of your house, and building simplified tunnel boring machines, Musk wants to make mankind an interplanetary species. Google have a name for things like this when they do these kinds of projects internally – BHAG or Big Hairy Audacious Goal. And let’s not mince words here, creating Gmail and making it the leading email platform in the world is a sliver of the audaciousness as colonizing Mars. While people like us are awestruck and excited by his dreams, a significant portion of the established space industry thought and still think he’s nuts. Sadly, many of those people work in senior positions for NASA – which probably explains, at least in part, why they haven’t had the ability to launch their own astronauts into space for seven years and with current timelines, that number will blow out to a decade before their next generation launch system is ready to go. But NASA isn’t what you’d call “limited thinkers”. They don’t lack ambition or motivation to achieve big goals. No, they lack even a smidgen of appetite for risk. Right now, NASA and SpaceX are having a quiet dispute about a technique called “load-n-go”. SpaceX has a contract with NASA to start sending astronauts to the Space Station which SpaceX wants to start doing in 2019. Part of the sequence for fueling the rockets that SpaceX uses loads the supercooled oxygen and highly refined kerosine rocket fuel AFTER the astronauts and payload are onboard. This has sent red flags up at NASA who fear that if there’s a fuel loading problem, the astronauts will be blown up on the launchpad – rocket fuel is unstable by its very nature. SpaceX is saying that the Dragon Crew capsule, in the event of a catastrophic failure like that would disengage from the main booster and ferry the astronauts to safety – they’ve actually planned for that eventuality in their design. NASA, and to be fair, the entire establishment space launch industry are saying that “load-n-go” is unsafe and an unacceptable risk. This is why, frankly, NASA has failed grossly to successfully build its own rockets and why companies like Boeing are having their lunch eaten by SpaceX. Elon Musk looks at risk differently – it’s an engineering problem to be solved, not something to be avoided entirely. If the fastest route to your destination has a fast flowing river in the way – NASA is willing to walk five times further out of the way to bypass the river and Musk wants to figure out how to cross it immediately. Musk has been told that building a rocket company was crazy. He was told that landing boosters and reusing them was crazy. He was told that strapping 27 engines together from three rockets to make one big rocket was crazy. He launched he launched his electric car into space onboard a rocket with 27 engines from three main boosters strapped together and then separately landed all three main boosters simultaneously… on the first attempt. People who lack vision call things they can’t comprehend crazy and dismiss it. Now, let’s come back down to earth and bring it home to you. You want to achieve something. Maybe you’re a stay-at-home parent who wants to start an online business in the few extra hours you have to be able to contribute to the family’s income. Or maybe you’ve got a day job and you’d like to build your own passion project business online during the evenings. Whatever it is, I’m betting that there are people in your life – friends, family or maybe even your spouse, who are not supportive of your ambition. 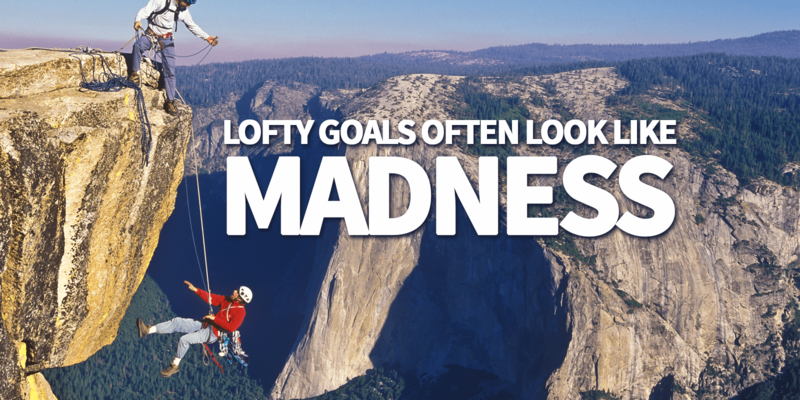 They might even think your goal is crazy. You want to be the crab that escapes the bucket, but the other crabs, the crabs who are closest to you are inexplicably holding you back and preventing you from escaping the bucket. The first one is quite simple, they don’t want to see you fail. They think that you’re going to pour your effort and soul into a venture that they probably don’t understand and they think your likelihood of success is quite low, so failure is a high probability outcome. They want to spare you that failure. The second answer is kind of related to the first one in that they lack the vision and ambition that you have. You’re the one with the lofty goal here, they’re just looking to maintain the status quo. They can’t see the bigger picture that you see and frankly they probably don’t want to. They think you’re crazy because what you’re suggesting is probably so foreign to them, that they can’t understand why you’d want to do it. And change is hard to accept – you’re talking about doing something different and that’s not what they expect from you. So in a nutshell, in their minds, you’re acting crazy. But one thing that’s worth point out is that a lot of the time throughout history, genius has looked very similar to insanity. My advice is, hear them out, give them the opportunity to air their opinions and promptly ignore them. You set your goals, your dream your dream and you go get stuck into achieving it. The worst that can happen is that you fail and they tell you that they were right all along, so what? Who cares? You just get up, dust yourself off and be proud that you took your shot. Elon Musk was told that he was crazy and now SpaceX basically dominates global rocket launches, meanwhile NASA’s SLS (Space Launch System) has been delayed again despite Congress giving them MORE money than they requested. Be more like Elon Musk, that seems like way more fun.